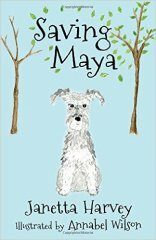 Saving Maya tells the story of two dogs who are destined to become sisters. An uplifting tale, based on a true-life story, not only introduces young readers to pet rescue, but also educates about the cruel reality of today’s puppy trade, where dogs are confined in farms to produce puppies. Janetta Harvey is a campaigner against the international puppy trade. Her previous titles include Saving Susie-Belle (John Blake, 2014) and Saving One More (Silverwood, 2015) where she explores life with her rescued dogs. Annabel Wilson uses art to highlight the many injustices that exist for dogs in the world today. A beautiful book. I wish everyone would read it. A wonderful story that will help to educate our next generation of dog owners and help dogs to find new homes. Illustrations are beautiful. A wonderful book that everyone should read. Excellent story for all to learn..not just children. Well written. It's very important that this should be made public - congratulations to the author for raising awareness. Truly wonderful, and inspiring my Schnauzer loved it! A wonderful educational book. Janetta Harvey and Annabel Wilson make a great team. A beautifully illustrated book highlighting a very important issue to children in a sensitive and engaging way. A beautiful book which helps our young people to understand the importance about treating animals kindly! A beautiful book for young and old who care about dogs and want to see an end to the evils of puppy farms. Great book for children to learn about puppy farms and to inform and educate them. Until I read this novel I was largely unaware of the evils of puppy farming. This book made me cry. Essential reading for anyone considering acquiring a puppy. Education is the most effective way to combat animal cruelty. This book is truly inspiring and an excellent way to educate children and adults. A wonderful book- a way to introduce children to dog rescue. Very well written and very uplifting. A beautiful, well written book which would appeal to all age groups. I would love to see this book Incorporated into schools curriculum. A lovely book, Beautifully Written, illustrated and getting The Message across loud, Clear on The Cruelness of Puppy Farming, and The tireless Campaigning that Janetta Harvey does is an Inspiration to us all Near, Far & Wide. Every School needs this book in Their Library to keep in The Public Eye The Unjustness, Cruelty of Puppy Farming. Outstanding book to teach children about puppy mills and how important it is to adopt!! A really good book that informs and educates. Beautifully written and illustrated. A powerful and uplifting story with a very important message. A must for every child. A beautiful book, and an extremely important one in reaching the next generation and teaching them to respect life. We have allowed/encouraged dogs to evolve in such a way that they rely on us for their care completely. We therefore have a responsibility to treat them ethically and with respect, and certainly without cruelty. It is a unique and precious relationship between human and dog and this book furthers the protection that must be given to this relationship. My granddaughter loves the story and illustrations. I like its strong message. Saving Maya is a truly beautiful book, full of understanding about the lives of breeding dogs from the puppy farm industry . This is a well written book which young people will enjoy and older people as well! A very useful educational tool. The pictures enhance the story of Maya and the happy ending with her "sister" and her new family. This is an incredible and inspirational book by Janetta Harvey and cleverly illustrated by Annabel Wilson. It should be required reading in all schools across the globe. This book should be in every library worldwide. It's a great way to educate children (and adults) about dog rescue and especially the cruel reality of the commercial dog breeding industry. A good read to introduce children to the cruel world of puppy farming. Beautifully written and illustrated so children (and adults) of all ages are swept along a journey with delightful characters they will love. The serious and truthful plight of puppy farming is approached and explained in a way that is easy to understand. A rare and truly inspirational read with delightful pictures at the turn of each page. I loved this book! It does an amazing job of educating the next puppy buying generation on puppy farming - this is so important as the cruel trade is on the rise, and puppy dealers are profiting from cruelty. Despite the fact this book explores the sad subject of puppy farming, this book has a beautiful and uplifting story and I loved reading every sentence. This is a wonderful, important book! Such a wonderful idea to inspire awareness and knowledge in the young, who are influencers in the puppy trade now and who will mature into the puppy buying public of the future. The collaboration between author and artist, who both genuinely support this cause in a practical as well as a cerebral way, make this book a sensitive & creative channel for informing young minds about the evils of this business. Love it. Excellent book on all levels, which introduces the reader to the horrors of everything associated with Puppy farming, accompanied by beautiful and powerful illustrations.A must read for all ages. Puppy Love Campaigns are happy to support this talented, caring author. A wonderful book with a very important message. An uplifting and ethical book, educating our children to be better people than we are. This book gifts us all to be more ethical and more knowledgeable in pet rescue and pet love and care from an early age. Now a difference can be made to the lives of pets; it is being led by our children and will be passed on to their children; what a legacy! What a great book to educate children about the wonderful rewards from rescuing a dog. This is a great book for young and old,nit deals with the awful truth about puppy farms in such an easy to understand way. I can't wait to hear more tales of Maya and her sister! Such an important story written and illustrated so beautifully. Wonderfully written book about a serious issue. Janetta Harvey in a very child friendly way, is educating a new generation about animal welfare, in particular the tragic issue of puppy farms. I have recommended this book so many times and have read it myself several times. Puppy farming is cruelty to the highest degree. To stop it, education is paramount. This book teaches young readers to make meaningful choices when the time comes to add a furkid to the family. A must read for all ages. As a teaching assistant in a primary school, I think this book is perfect for its audience with such an important message for all. Engaging, moving and absorbing with an absolutely vital message about how dogs are treated in our society which teaches care and responsibility. The beautiful artwork brings the characters and story to life. Amazing story with a powerful message that will help educate future generations to help rid the world of cruel puppy farms. A wonderful read. Heart warming and a tear jerker all at the same time, wonderfully illustrated and beautifully written. Brilliantly written and beautifully illustrated. Outstanding book to teach children about puppy mills and why it's so important to adopt rather than shop!! The best!! This book is an amazing way to open people's eyes to the injustices of puppy farming. Whilst aimed at children, this is a must read for all ages. An excellent read introducing children to the wrongs of puppy farming. A beautiful written book for older children about puppy farming and the awful conditions tthe dogs have to live in. Janetta has in her writing made the book come alive so when the children read they become Maya and then they are looking in from the outside its truly wonderful. a truly inspiring book for anyone, not just children which tells the story of Maya. It teaches the reader to understand the suffering of dogs inside puppy farms. Highly recommended. An excellent story, well written and perfect for both children and adults - carrying a very important message. Janetta Harvey deserves to win this award for bringing the hideous puppy farming business out into the open, and help to put and end to this barbaric and cruel trade. Superb book, beautifully written. It touched my heart. Fantastic book, takes a brace person to write such a book. I love Saving Maya! Such a great story with an amazing message. This in an invaluable book in the world of dogs. As well as being entertaining, charming and exciting for youngsters ( and adults actually) it teaches the future dog owners of the world about the world of puppy farming and how dogs are used to feed the puppy market. An absolute must for all schools and libraries.i loved this book!